Pauk can be used for any subject which requires factual knowledge. This can mean either basic knowledge or any knowledge that serves as a foundation for more advanced concepts. Vocabulary, History and Economics are all traditional topics for flashcard systems. However, Math also requires some basic knowledge of formulas and rules which must be learned by heart. Preparations for theoretical exams, such as a driver’s license test or for professional presentations can also be made on a flashcard system. Pauk can be used at any level of education. Pauk provides you with a structured method for preparing for exams, as long as you are able to read and write. Pauk supports the most groundbreaking learning strategies known today (Source) to not only help you prepare for exams in the short term but also to help you retain this knowledge in your long term memory. Seamless integration with your daily learning plan. With Pauk, you will increase your exam scores while decreasing the amount of time that you need to study. Younger scholars can teach themselves how to prepare for tests, without the requiring the constant support of their parents. According to the methods shown in the Sebastian Leitner System , cards will be placed in boxes labelled with a 0, 1,2,3,4 or 5. Each of these boxes represent how thoroughly each topic has been studied. Cards which are brand new and have never been learned, are placed in Box 0. You will then begin to study the cards. Cards will be promoted to the next box as they are memorized. Any cards in box 5 will be fully imprinted in your long term memory. Any cards which are not known will always return to box 0, regardless of their previous level or box. It is best to group your flashcards into matching lessons, each of which should contain about 15-40 question and answer pairs. You can work through these lessons at any time. It is even possible to drill your cards from level 0 to level 5 in a single session. You can also exclusively drill individual boxes from each of the five levels. This can be helpful if you have a lot of cards which are already on level 5, and you want to focus on the cards that you haven’t learned yet. This makes the process much more efficient. Studying the cards in one sitting and pushing them up on the same day can certainly help you cram for an exam. However, you must be sure that have this knowledge in your long term memory, by regularly spacing the intervals in which you repeat the cards. According to our experience, you will need to drill the cards up to level 5 on at least two different days to be adequately prepared for a basic exam, such as vocabulary. You will need even more spacing for complex topics, to solidify your understanding of the topic and ensure its place in your long term memory. Aside from employing manual spacing, you also can use the automated “SpacedRep” option. “SpacedRep” also uses the same boxes that you would use for manual timing, but automatically calculates ideal intervals for cards repetition. The system will test you on each card right before you are expected to forget the answer. The learning sessions for an average person have default spacing values, which can be found in the literature. These values bear a striking resemblance to the Fibonacci number sequence. 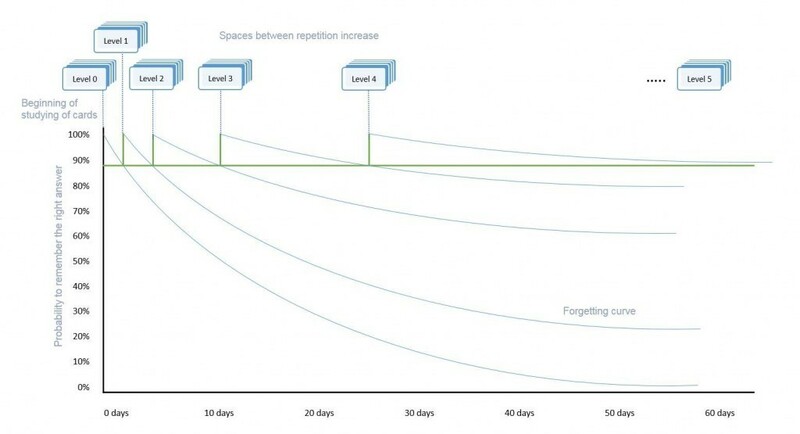 In addition to the default timing values, there is also a self-learning algorithm (“MySpacing”), which adapts the repetition intervals to your individual learning style and the complexity of the cards that you are reviewing. You can use your own manual spacing, the default intervals, or the self-learning automated spacing to learn as much as possible on Pauk. It is necessary to space your repetition so that you can keep the facts in your long term memory. By doing so, you will have more time to prepare for your exams, but with a smaller number of repetitions. It has been said that this is a more efficient way to learn. However, we know that your time is precious and that this plan cannot always be followed due to daily duties such as work, social life or other events. The ultimate goal before an exam is to get every flashcard to at least to level four, with the majority on five. So what you do with the remaining cards, which aren’t at these levels yet? We have created exam mode with this issue in mind. KickStart is the name of a specific Learning Algorithm, which is ideal for topics that you have to memorize from scratch. KickStart has two functions: It splits lessons in smaller units which are easier to memorize, and pushes back incorrectly answered cards so that they can be reviewed more frequently and rapidly. KickStart ensures that you will repeat incorrectly answered cards more quickly and frequently. There is always a risk of memorizing the incorrect answer instead of the card’s correct answer. Why does this happen? The effort you put into answering a question from memory is much greater than simply reading the correct answer while checking to see if it was right or wrong. This is why we will memorize a self-constructed answers. The correct answer written on the back of a card will often not leave enough of an impression to overwrite one’s memory of a self-constructed answer. This false memory must be immediately and thoroughly corrected before enters your long term memory. The most efficient way to reverse this false memory is to quickly repeat the same question, until you answer it correctly at least once. Furthermore, KickStart splits entire lessons, in smaller units which are simple and quick to learn. These smaller portions can be drilled to level 5 in the blink of an eye. The sizes of each unit are large enough to push your mind to permanently memorize the answers while their size allows you to attain to level 5 in a heartbeat. We assume that any cards on level four or five are rather well known and stored in your long term memory. You can always do a quick review of these cards, but there’s little reason to overdo it – you will get extremely bored it you repeat them too much. At this point, you should focus on the cards in the boxes 0, 1, 2 and 3. Exam mode allows you to select individual levels to train. Levels 0, 1, 2, and 3 are ideal right before an exam, and they should be pushed up to 4 and 5. We have found that it is typical for only 15% of these cards to be in these lower boxes, while the remaining 85% are already on level 4 and 5. This means that you should only focus on the 15% you don’t know. This can save you a lot of time as you focus on your gaps and not on what you already have memorized. By doing so, you can effectively manage the repetition of a large amount of material right before your exam. Pictures and or audio recordings can be stored, as well as internet links to external sources like Wikipedia, Youtube … , and math formulas via Latex etc. can be stored on any flashcard. Answers which are more complex may require you to know several facts which belong to a correctly answered question. You can display a number of prerequisite facts on any of your cards. This functionality can be very helpful since it pushes you to remember additional facts if you know that something is missing. New lessons should contain always contain 12-40 cards. However, repetitions of several sets of 100 cards are possible once the material has been studied. With this in mind, you can combine smaller lessons into a large block of cards which contains all of your knowledge. By doing so, you can repeat one entire topic with a plethora of cards in a single file. Use less time for your preparation and score higher at the same time!